Wyandotte County leaders are getting a chance to tell a state transportation task force what they need to help the county develop and improve. Governor Jeff Colyer signed Senate Bill 391 into law, creating the Transportation Vision Task Force in May. The group will be evaluating the current transportation program and making recommendations for future projects needed across Kansas. Wyandotte County leaders have a list of projects they will be presenting to the legislative group Wednesday in hopes that some will make it on the list for the future. KANSAS CITY, Mo. — Wyandotte County leaders are getting a chance to tell a state transportation task force what they need to help the county develop and improve. Governor Jeff Colyer signed Senate Bill 391 into law, creating the Transportation Vision Task Force in May. The group will be evaluating the current transportation program and making recommendations for future projects needed across Kansas. Wyandotte County leaders have a list of projects they will be presenting to the legislative group Wednesday in hopes that some will make it on the list for the future. 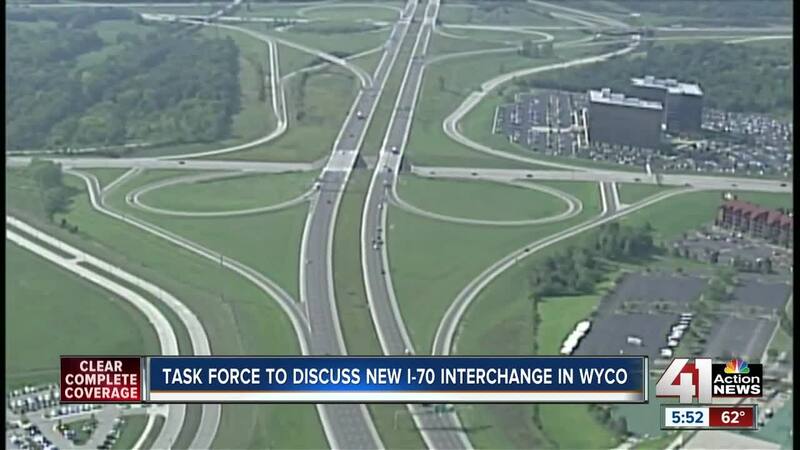 "One of the major ones is I-70 at the Turner Diagonal interchange," said Mike Taylor, public relations director for the county. "To the north of I-70 there's hundreds of acres there that are primed for development there, but we can't get to them with that interchange the way it is." Taylor said they would like to see a new, more modern interchange there. "Probably one of those diverging diamond interchanges — making it not only easier for the trucks from Amazon to get on the highway, but to open up all of that land. We've got a private developer who has expressed interest and said 'I've got clients we could build warehousing or other things north, but we've got to get the interchange built.'" Taylor said they've discussed this project with KDOT and there are some funds that may be available for it, but not enough. "It would be a lot, tens and tens of millions of dollars," he said. The second project on their list would entail the area near the Kansas Speedway and the Legends. "If you ever go out there when there's a Sporting KC game, the traffic just backs up on I-435 coming up from Johnson County," Taylor said. 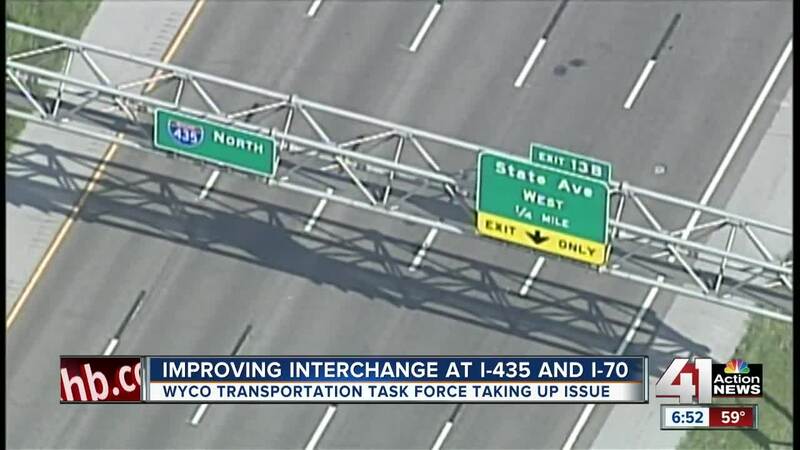 The county would like to improve the I-435/I-70/State Avenue interchange to help with traffic flow. "That interchange is so antiquated, they loop around and the wait is forever," he said. "So really we need to rebuild that interchange as well." County officials will be meeting with the task force on September 12th at Memorial Hall in Kansas City, Kansas. If you would like to submit feedback or testimony for the task force concerning Johnson County projects ahead of the Nov. 8 meeting, click here . "The TaskForce will be composing their recommendations on the 28th and 29th of November and then the report will go to the legislature for consideration," said Kansas State Senator Pat Pettey, who is on the task force. "We will identify specific projects that have a direct effect on the economic health of the state of Kansas and its residents.We will make recommendations regarding the needs of the transportation system over the next 10 years and the future structure of the state highway fund." The task force is comprised of committee leaders and members of the Kansas House and Senate, Kansas residents, industry stakeholders, local government representatives, and multiple cabinet secretaries. It will report its findings to the legislature by January 31, 2019.